ARLINGTON, TX - APRIL 21: Manager Jeff Banister of the Texas Rangers talks with home plate umpire Bill Welke following the in the sixth inning at Globe Life Park in Arlington on April 21, 2016 in Arlington, Texas. 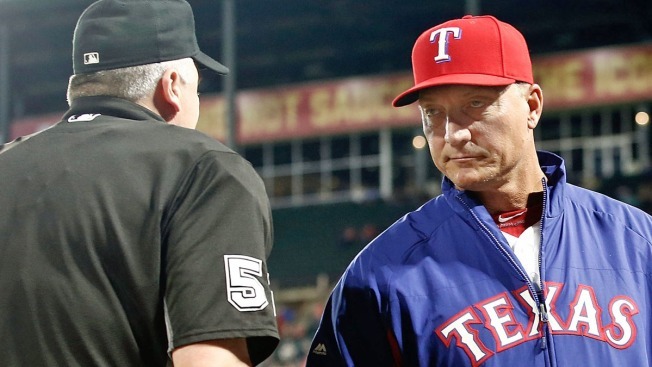 Texas Rangers manager Jeff Banister left the team on Saturday morning to be with his ill mother. Banister's mother, Verda, lives in Clear Lake, Texas. Bench coach Steve Buechele will manage the last two games of the Rangers' series against the Oakland Athletics. The Rangers were on the fringe of the American League wild card race, going into Saturday trailing the Minnesota Twins by 3 1/2 games for the second wild card spot. "The circumstances of this are terrible, but family first," Buechele said. Buechele learned about Banister's situation on Friday night but said he didn't know Banister would be flying back to Texas until Saturday morning. "I don't think he knew," Buechele said. Buechele surfaced as a candidate for the Colorado Rockies managerial vacancy in 2012. He interviewed by phone for the position before the Rockies hired Walt Weiss. "In the game of baseball, you don't ever know what will be given to you or afforded to you," Buechele said. "I feel lucky to have the job I have now. Should the opportunity arise somewhere down the road, yeah that would be nice, but that's certainly not on my radar right now."